Dimensions: 34" Width x 76" Length Rough Opening - Right or Left Hinge Hang. Optional items that may need replacing: Safety Chain, Storm Door Hardware Kit and Entrance & Deadbolt Combo Lockset. Nice door, great quality...makes my newly renovated home look even better! Thank you! replaced old brown door and grey storm door with this door. great looks and solid built, we love that glass storm door. installed in 30 minutes the hard part getting old door out make sure all old screws are out some of mine were hidden. I had an OLD door that looked like junk, this was the perfect replacement. I did replace the existing board under the old door so the new door would have a solid perfect fit. No complaints at all. Overall it took me about an hour to install with the new trim work. My wife is very pleased but now she thinks I am a handyman! Ha! Anyone can install this. This was a Christmas gift for our son and daughter in law. Product was better than expected - had a peephole and door knocker. Easy to install - no adjustments needed. This is the second item we have ordered from Mobile Home Parts Store and have been very pleased with their customer service and products. After ordering the correct size, I love it. I like my door and it looks very nice on my house. Installed our new combo door yesterday morning! From removing the old nasty door to putting in my beautiful sunflower(I painted it) yellow combo door, it took about 1 1/2 hours! It fit beautifully, looks amazing and I couldn\'t be happier :)Watch the video, it really is that easy. Thank you. Easy installation and looks great! Would recommend!! Great door! Fast shipping and very easy to install! My husband had the old door removed and the new door put in in less than 30 mins! Great product! I recieved this door 4 days after ordering. Very easy to install, perfect fit, and of excellent quality!!! The door is very well constructed and we are very happy with the upgrade look it gave our home. A local company wanted more money for a lower quality door. We are very happy with this product. The only improvement that we would suggest is that installation instructions be included for DIY installation. Nice door & fast shipping. I love my new door - it is GREAT. First, let me say that the door was packed for well. Then, the installation was very simple. I bought the bit for the drill which really helped the installation. I am very happy with this company and will definitely buy more products that I need. 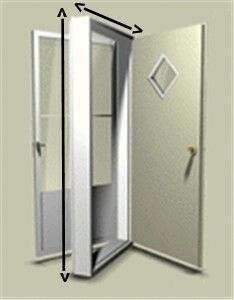 VERY FAST IN EXPEDITING PRODUCTS THANK YOU FOR THE CONFIDENCE IN THIS CO.
Q: Can this door be painted? Q: how can you tell if you need a 6 inch or 4 inch sidewall jamb ? A: Measure the thickness of one of your window sills. The sidewall thickness will be the same on all exterior walls. Q: Door jamb is 33 1/2 X 75 1/2 but our storm door is 32X75 and our exterior door is 32X75. Going by your instructions should we order the 34X76? A: 1 pack of 50 screws is enough for a door.